As a note, all the places I were taken to, was with Wendy (Bliss Travels). She just knows the all best spots! Be sure to check out my Michelin-Star experience here. I want to start with my last meal of the trip with everyone. We drove out to a country auberge that’s quite off the beaten path for a four-course Sunday lunch. I love a good rustic setting. The food was amazing from start to finish with the rosé flowing. I love how fresh everything was. 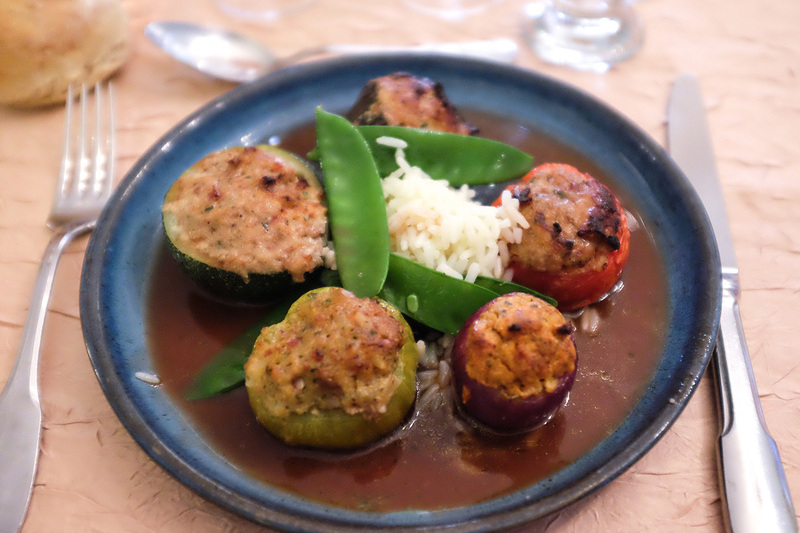 Here at home, farm-to-table is a specialty, but out in Provence it’s just life. I’m going to miss this. 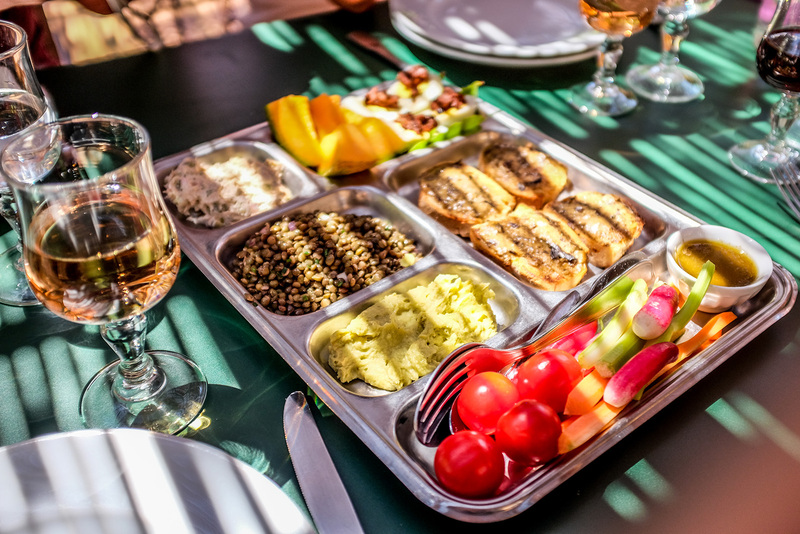 We started with a family-style entree tray of tuna with creme fraiche, mushroom toast, smashed peas with mint, lentils with shallots, vegetables with anchoiade, and melons. For out main course, we had a choice of beef daube with walnuts, sliced leg of lamb with garlic, and trout almondine. I went with the trout with almonds because I was loving the tuna from earlier and always ready for more seafood. Our side was a hearty potatoes dauphinoise and topped with tomatoes. 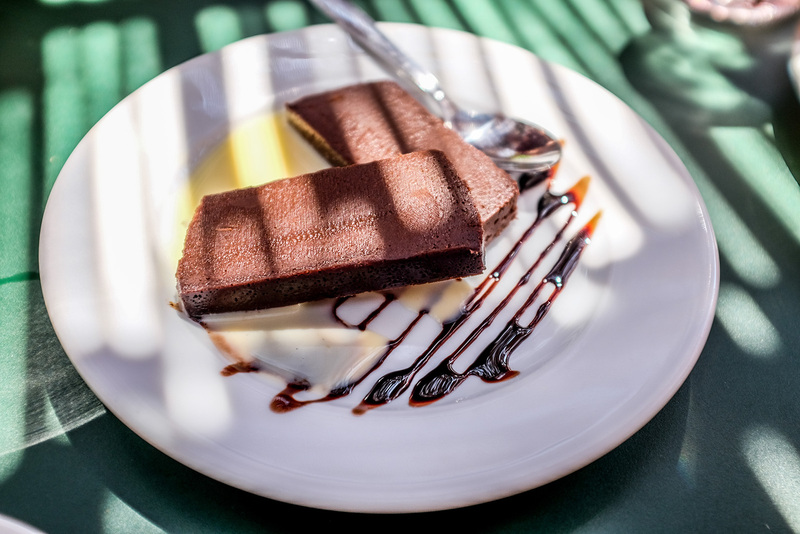 Finally, our dessert of flourless chocolate with crème anglaise was heavenly. I could’ve went for round two of that. The one recipe I am taking back with me from Provence to make at home is the clafoutis. I first tried it during breakfast at the hotel we stayed in. 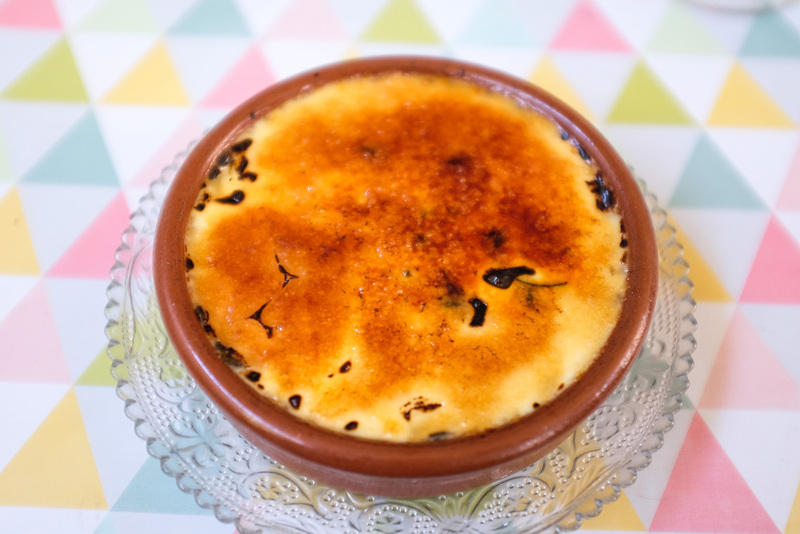 It is a baked custard dessert (similar to thick flan) with black cherries tossed in. I tried it again during another lunch. Which leads me to the aioli. For all garlic lovers, this is definitely another must have when you’re in Provence. We went for an aioli meal at a small hilltop restaurant that really shows the Mediterranean influences in Provencal cooking. 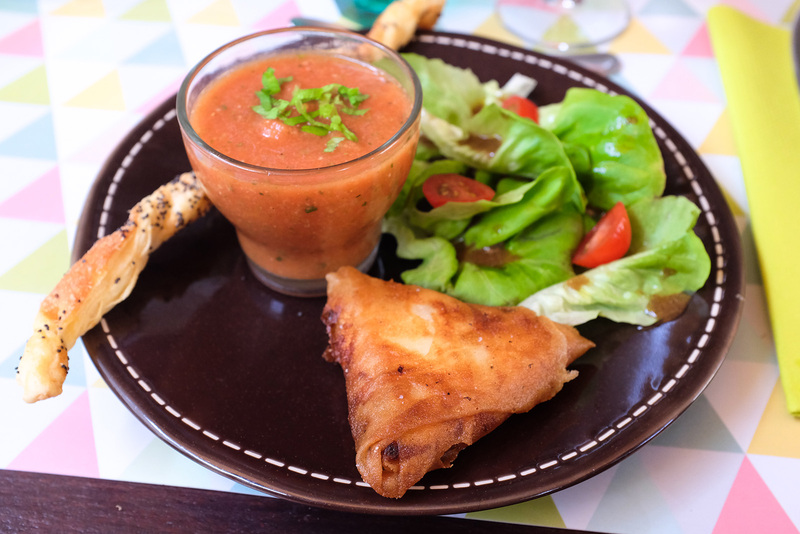 First, we had a salad with gazpacho and the most delicious phyllo triangle filled with goat cheese and walnuts. 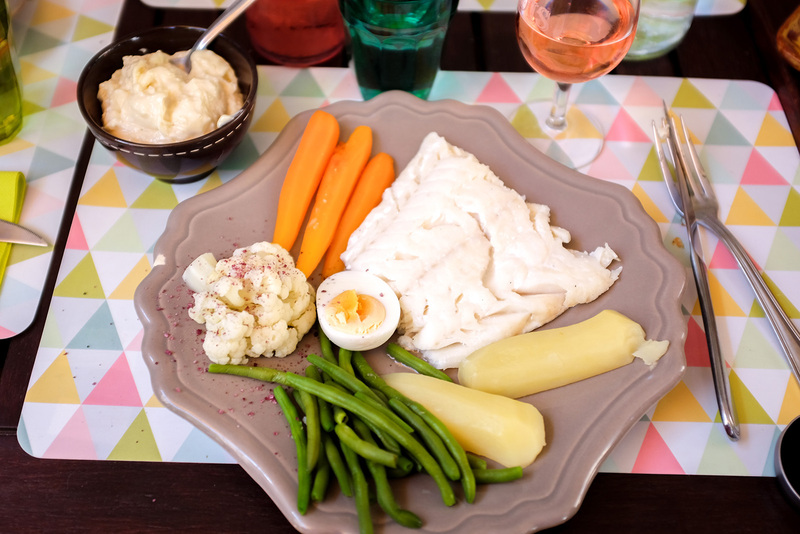 Our main course was the Grand Aioli platter of cod, potato, green beans, boiled egg, steamed cauliflower and carrots. I just loved dipping everything into the aioli (garlic mayo). As for dessert, we had the cherry clafoutis and lavender creme brûlée. Yum. What is it? It’s a creamy nutty goat cheese wrapped in chestnut leaves in a circular fashion and a Provencal specialty, from the town of Banon. It’s the best melt-in-your-mouth cheese I’ve ever tasted. 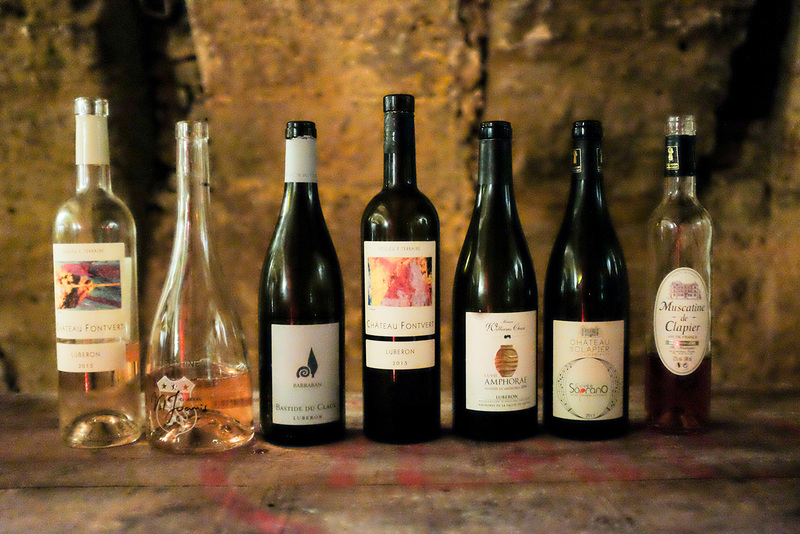 I first had it at a the most fabulous wine tasting inside a cavern. Though dark, it was pretty cool and the food setup was such a bounty. 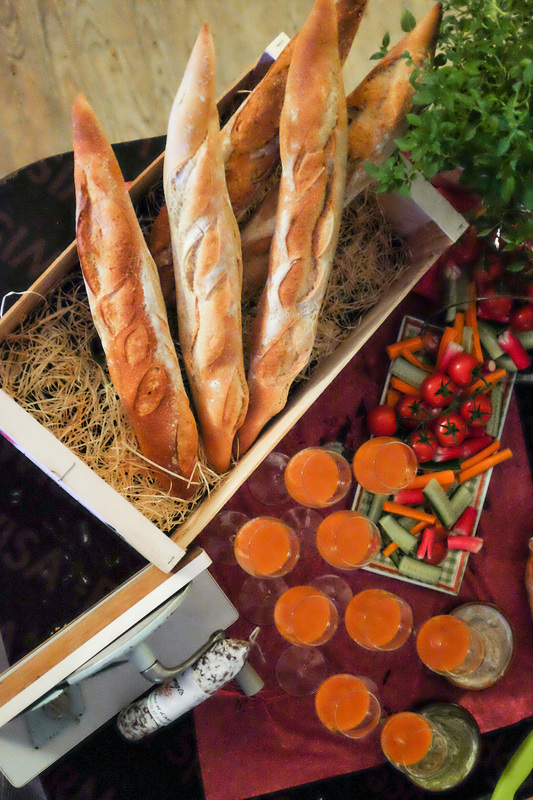 We paired our wines with everything from pissaladiere (anchovy and onion tart), tomato mustard tart, a variety of cheeses, hams, gazpacho, apricot tart, vegetables with anchoiade and pesto dips and papeton d’aubergine. Our first meal in Provence! A very simple and homey meal at our hotel. Our starter was a salad and tomato coulis with papeton d’aubergine, which is an eggplant terrine. As someone who usually isn’t too fond of eggplant, it tasted so wonderful. I didn’t even realize it was in the mousse. 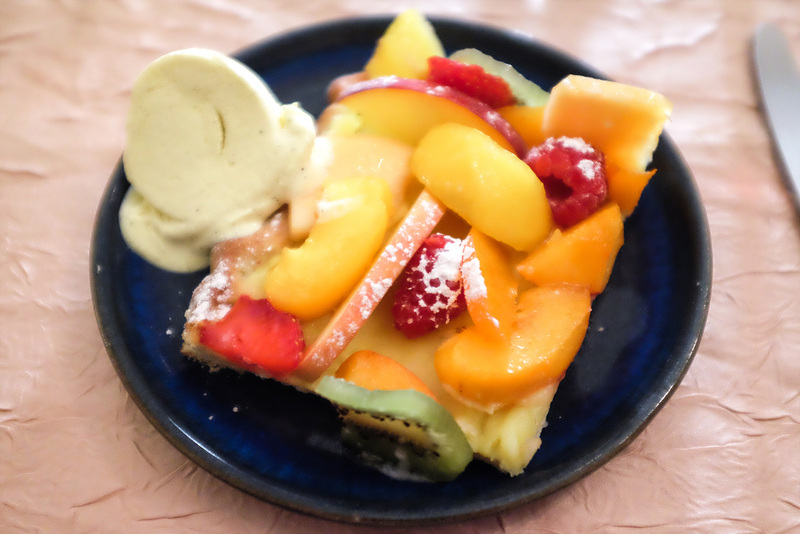 Following that was a very scrumptious plate of legumes farcis (meat stuffed vegetables) and a fruit tart. It was the perfect meal after hours of travel and all you want is a comfortable hot meal. Of course this includes glasses of rosé, which I drank more than water on this trip. Provence is where it originated after all. Yes, I brought back bottles. All our meals were paired with wine and wine tastings are a must. Try the locally bottled and if you’re with Bliss Travels, all the other French regions. On her wine trips, clients all get a personalized wine glass for tastings. Best thing ever! 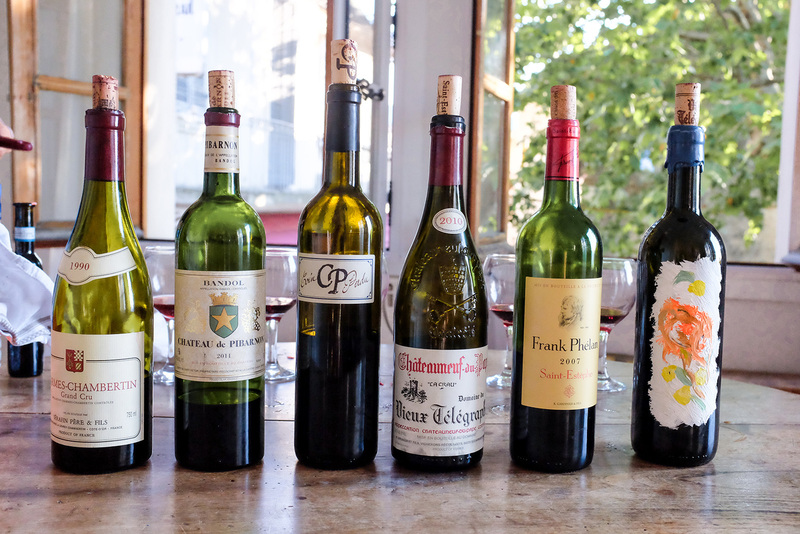 On our final night, we tried a variety of regions and I ended up loving the oldest bottle there — from Burgundy. It was the 1990 Charmes Chambertin, Grand Cru Burgundy. The best things about wine tasting is that you find out what you like and how your palate works. As for me, I always learn something new each time. Gotta love provencal food & living! I know I do ;) Wonderful post.